Students at Belfry High School in Pike County show off their robot design. ASHLAND, Ky. – Kentucky Power and American Electric Power is offering schools and teachers in eastern Kentucky extra money through grants. 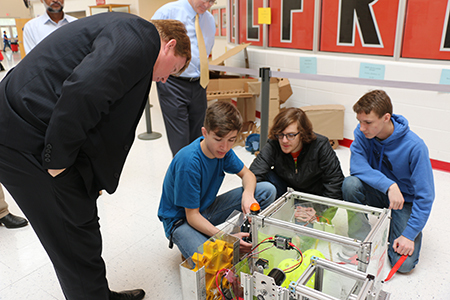 AEP has earmarked funds for Kentucky Power to award to area schools through the FIRST robotics program and the Teacher Vision Grant Program. FIRST (For Inspiration and Recognition of Science and Technology) is a multi-national robotics competition that teams professionals and high school students to solve an engineering problem in an intense and competitive way. Grant amounts range from a couple of hundred dollars up to a few thousand. Smaller grants are available for elementary and middle school robotics. Online applications for the robotics grants must be submitted before midnight EST, Jan. 25, 2019. There is a limit of one grant per program, school or organization per year. First time applicants will be instructed to enter their email address and create a password to begin the application. Previous online applicants can sign in using their email address and the password that was previously created. The FIRST robotics grant initiative is one of several programs sponsored by Kentucky Power and its parent company, American Electric Power, to support pre-kindergarten through 12th grade education with an emphasis on science, math and technology education and careers. Kentucky Power, in partnership with AEP, also funds the Teacher Vision Grant program, which provides small grants to individual teachers to use in their classrooms. Grants range from $100 to $500 each, and are limited to one per teacher and two per school. The deadline for that program is midnight EST, Feb. 22, 2019. A link to the online application for both grants is https://www.GrantRequest.com/SID_1313?SA=SNA&FID=35011. Kentucky Power, a unit of American Electric Power, launched the Teacher Vision Grant program in 2003. Teachers submit their project proposals for funding consideration to Kentucky Power. All educators who live or teach in the AEP service area or in communities with major AEP facilities can apply. Projects that have an academic focus and a goal of improving student achievement are eligible for consideration. AEP has a special interest in science, mathematics, technology, electrical safety and the balanced study of energy and the environment. Kentucky Power, based in Ashland, serves about 168,000 customers in 20 eastern Kentucky counties.